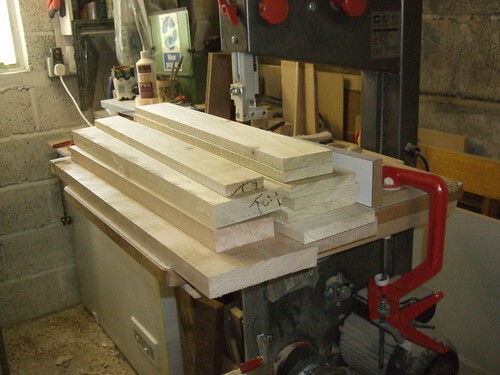 This time last year, I was building a 6ft long solid beech workbench on my drive way. Ever since I finished that build (and I’ll have a ‘reminder’ post for you, hopefully within the next week), I’ve been meaning to fit a series of drawers underneath. Well, I have more spare wood than every in my workshop right now. I’ve been so sick of stumbling and tripping over it lately that I decided, last week, to take a break away from my other projects and to get these three drawers done instead. That shot reminds me of how spacious my workshop after reorganising to fit my new bench in and having a small 12in bandsaw… As much as I love having a 16in saw that’ll happily resaw wood all day long, it still commands its fair share of floor space… One day though, I hope to be able to move in to a larger space… I don’t think I had a lathe back then, either and there’s now a cast iron bench top mortiser sat where you can see my disc sander in the background. Some time between then and now [it might have been early this year? ], I spent a couple of hours sawing up a sheet of 18mm exterior plywood, which would for the simple carcase for the drawers. Nothing particularly special about the way this unit was jointed (rebates, screws and lots of glue) but, I did choose to lip the front edges of the ply with 6mm thick brown oak, mitred at the corners. 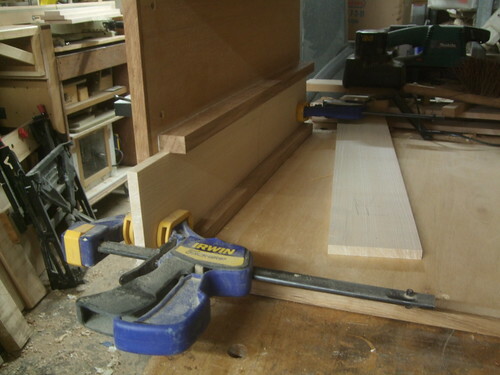 When you’ve gone to the effort of making a an entire workbench from solid beech, it just gives the drawer carcase (otherwise bordering on crude) that little extra touch. 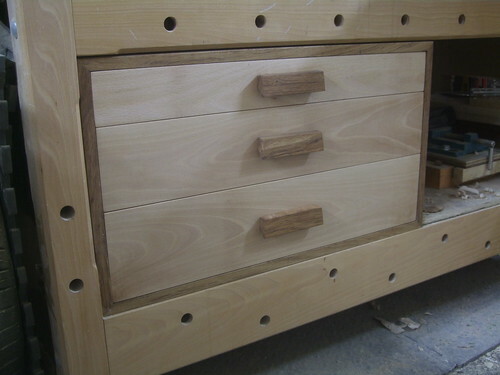 The drawers themselves took only a couple of afternoons to make, with all corners jointed using hand-cut dovetails. After preparing the timber on my planer-thicknesser, I used the sides as a template to space the runners (more brown oak) correctly. These are glued and screwed in place from the outside; again, nothing fancy about this. No need for a front or back drawer rail, either. 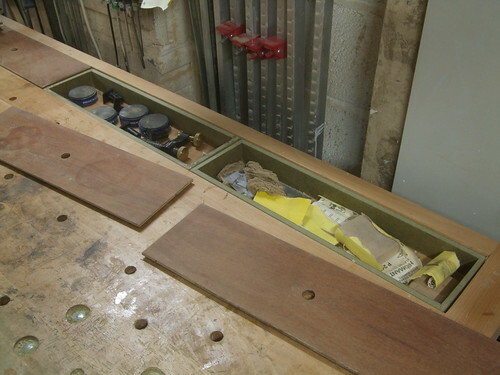 As the drawer fronts will overlap and hide the runners, I could set them back from the front edge of the carcase (20mm) and use them as a travel stop to prevent the drawers from going too far back and disappearing. 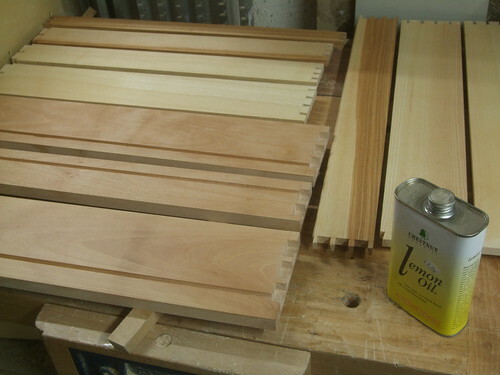 Before assembling the drawers, I gave all the inside faces a coat of Chestnut’s Lemon Oil, for a change. I’m hoping this will reveal a pleasant aroma when each drawer is opening (and, perhaps also, to help the fight against depression…), as other oil finishes are renown for smelling “horrible” and even “rancid” once they’ve been cooped for long periods of time… The smell wasn’t initially as strong as I was expecting but, this was another one of those finishes I purchased back in 2008. Oils don’t last for ever and, even despite the fact that I hadn’t opened the tin until recently, there’s a chance it may have ‘gone off‘ slightly in all this time… I’d say it smells more like lemon-flavoured boiled sweets, rather than lemonade or similar. It is quite pleasant and I will try to use it again in a real project. 😉 It does darken lighter timbers but not quite to the same extent as Danish oil (which I used for the outsides). You may also be able to see, in the photo below, that the first coat was quite “blotchy“… Well, it certainly soaked in to the beech very quickly; more so in some areas than in others. Ash was much more consistent. One downside is that it takes a good twenty-four hours to dry properly – we’re not talking raw linseed oil-drying times here but, I found that my rags were still soft (and dry) several days later. 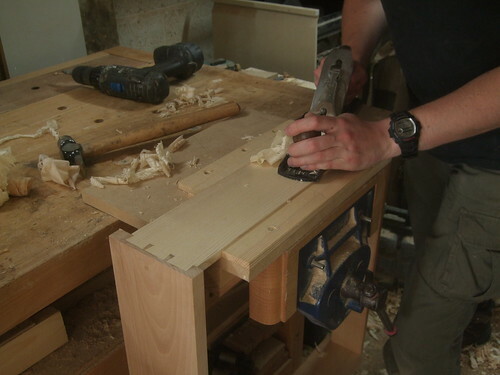 I did get to use my drawer planing-jig again, which I made last summer to assist in the construction of a pine chest of drawers. I’m quite pleased with the way these drawers came out. I rushed them a bit but, the dovetails still look very good. 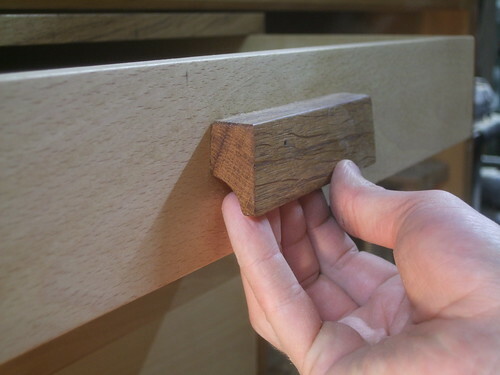 I fear that using oak would’ve been a bad choice as it would ultimately have meant the sides would be the same colour as or darken than the pins from the drawer fronts. 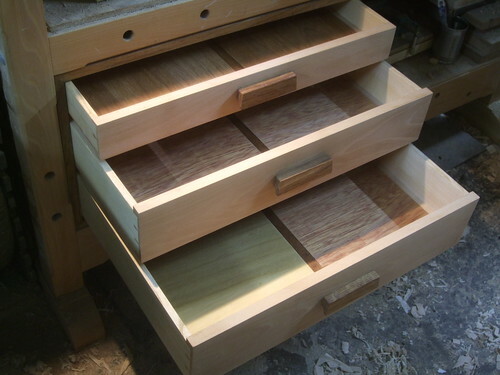 “Grain-matching” of the drawer fronts wasn’t perfect but, on something like this (for the workshop! ), it really doesn’t matter. I’ve already begun filling these drawers and I’m thinking of buying some rubber mats to line the insides. That should stop some of my chisels and things from rolling about so much, each time the drawers are opened or closed. These also turned out very well yet, as I’ve said before; whenever I’m building something with at least one drawer, this always feels like the hardest part, to me; getting the hardware right. As woodworkers though, I believe we should aim to be as creative as possible [although, I am going to contradict that statement, next week… :roll:], instead of buying something off the shelf. Yes, I do like to think that these drawers, along with the workbench, will be around for decades and generations to come. With technology increasing all the time, they should be able to find out who I was!! 😀 A bit like in that film, A.I. …Only, without the aliens! Already, they’ve helped to ease the congestion of tool storage in my workshop and I’m kicking myself for not doing this much sooner! It’s also freed up some valuable space within my secure filing cabinet (which is where my valuable hand planes will remain). 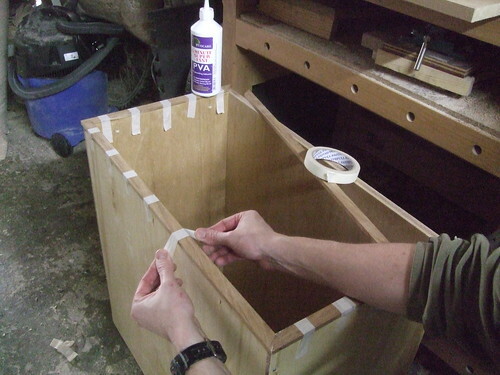 Though, I will endeavour to make as much use of the tool well boxes as possible (these were also finished with lemon oil, just for your information). 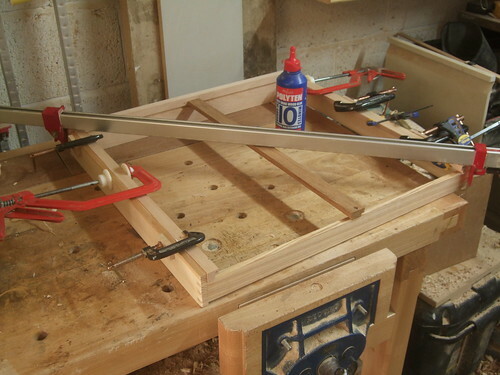 As I said at the beginning; I’ll be briefly revisiting the Summer 2009 build of my workbench, for those who missed it the first time around – stay tuned for that! There are still a couple of other alterations I’d like to make to my year-old workbench but, I’m sure those will come, in time. Nicely done. The half blind joints are done very well. 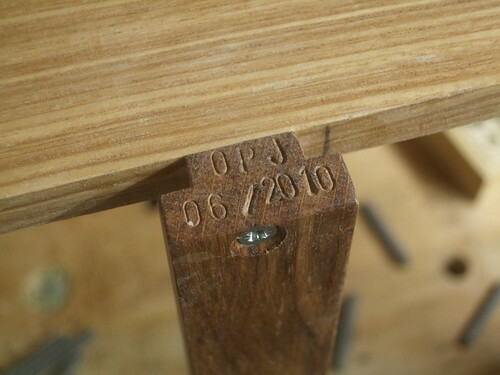 I like the hand cut joints and the date stamp is very cool. How is the chair coming along? The chair is almost done, I just don’t have the time to work on it at the minute as we’re in the middle of a practical exam at college right now (remember the sketches of a wall cabinet I put up a few weeks ago? That’s what I’m making). I’ve been so busy, I haven’t had a chance to photograph it without the clamps on! Stamping my initials and date is something I try to do with just about everything I make now (mostly furniture). Most of the time, they’re pretty well hidden (top end of a table leg, for example) but, it’s nice to no they’re there and I like to think someone will find them in decades to come… 🙂 I would like to get a proper stamp made up but, for now, I’m quite happy using a cheap set of letter and number punches (at least, until I can come up with a logo or similar). Lovely Olly, to nice for an under bench, your workman ship is impeccable! Nicely done Olly! 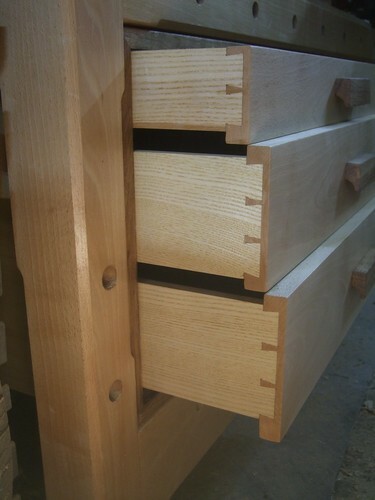 Dovetails look cracking. Does the location of the drawer unit limit your use of bench dogs and holdfasts?